A solo backcountry skier, a kindergarten teacher, was known to walk and skin up the Jones Pass road, gain the ridge and ski down something safe. In xxMonth he was reported missing. Alpine Rescue started the search, found his car at the trailhead, but couldn’t locate the missing party. After a stretch of lousy weather, Alpine continued their search and found his backpack near the road. Also found avalanche debris, but not sure if it was part of the incident. Dale Atkins of Alpine requested C-RAD support. 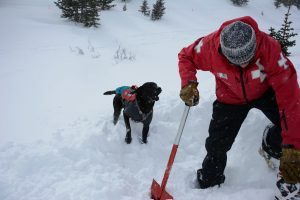 Two C-RAD teams responded on xxDate with “ground pounders” from the Alpine Search and Rescue team. C-RAD searched the west and east side of where the backpack was found, but turned up nothing. Also searched north, where the cornice broke, but again nothing was found. An Alpine team spotted the missing party with binoculars, further south, on a southwest aspect. C-RAD members supported the retrieval with carrying up a sked, rigging the uphaul to get the victim back to the ridge, and then skiing the akja down. Speculating the lost party probably got disoriented and walked the wrong way – to be found so far away from his pack. He may have lost his footing and took a slide down into the rocks, a slide so powerful that one his ski boots was shattered. It’s likely this “slide for life” into a scree field resulted in this fatality. 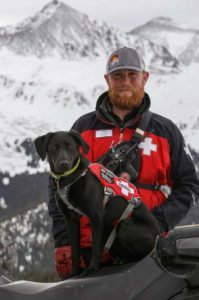 Alpine Search And Rescue is grateful for the K9 assets involved, as well as the rescue techniques and skills from all C-RAD members involved in order to complete the recovery.